Posted by admin in Eyjafjöll, Iceland, volcano culture. A spontaneously organized workshop and open call for papers gathered together analyses from different perspectives – systems theory, impromptu surveys, personal reflection, literary and philosophical probing. This introduction explores some of the connecting themes and highlights the strange, surprising and potently revealing nature of strandedness in a world of mobile lives. Among the contents: ‘Anticipation, Materiality, Event: The Icelandic Ash Cloud Disruption and the Security of Mobility’, ‘A Fiasco of Volcanic Proportions? 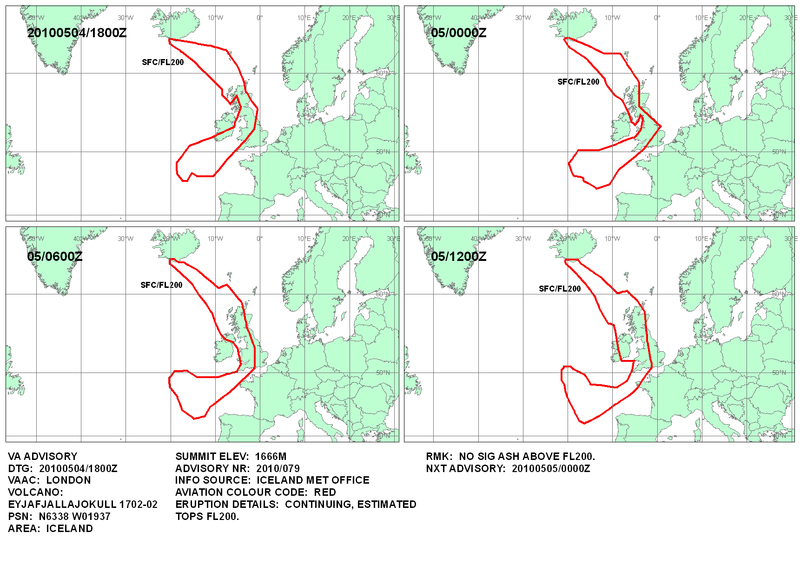 Eyjafjallajökull and the Closure of European Airspace’, ‘Inspired by Eruptions? Eyjafjallajökull and Icelandic Tourism’, and ‘Fire as a Metaphor of (Im)Mobility’. The full list of contents, with links to abstracts, can be found on the issue’s webpage. The contributors include scholars in geography, transport studies, business and management, tourism studies and sociology. I’d like to tell you more about this, but sadly my university library subscribes to Mobilities via EBSCOhost (ugh – the clunkiest and least customer-responsive of the online journal collections) which has a 1-year moving wall for this title, so I can’t yet read any of this mouth-watering collection without paying up to do so. I am not opposed to paying on principle, I just can’t afford it. * When it comes to exploring the significances of the Eyjafjallajökull eruption and its consequences, the name ‘Stranded’ has of course already been used. Posted by admin in activity reports, Eyjafjöll, Iceland. Minor earthquakes have been recorded under Eyjafjallajökull and neighbouring Mýrdalsjökull, reports Iceland Review Online, but despite continuing rumblings marking the first few days of 2011 there are no signs of anything new and significant happening under the star volcano of 2010. ‘Scientists have speculated’, Iceland Review Online reminds us, ‘that the eruption in Eyjafjallajökull might trigger an eruption in the bigger volcano Katla’, before admitting rather wistfully that ‘there have been no signs of an upcoming eruption there either’. Icequakes as well as earthquakes have been taking place around Eyjafjallajökull over recent days, as the very cold weather has been producing violent cracking in the volcano’s icecap. Posted by admin in current research, Eyjafjöll, geoscience, Iceland, natural hazards, volcanology. A fascinating article in Science News, magazine of the Society for Science and the Public, explores the role of ice in volcanism with particular reference to the eruption of Iceland’s Eyjafjallajökull earlier this year. When Eyjafjallajökull erupted on 20 March 2010 it began with a fissure eruption characterized by relatively quiet effusive activity and limited ash emissions. This changed in mid-April when the seat of the eruption moved west to an area beneath the ice-cap. As the eruption became sub-glacial, explosivity and ash production increased, with the disruptive consequences that we are all familiar with. The Science News article, an excellent piece of work by Alexandra Witze, looks at some of the research that is now going on in the wake of the Eyjafjallajökull eruption to explore the crucial issue of glaciovolcanism – the interaction between volcanic activity and ice. Eyjafjallajökull’s eruption has refocused attention on a small but rapidly growing subset of volcanology: the study of volcano-ice interactions. Ice-covered volcanoes, or “glaciovolcanoes,” are not fundamentally different from other volcanoes in terms of plumbing or eruptive style. But they distinguish themselves the moment magma breaks through the crust and meets ice. One reason to study icy volcanoes is to better understand their risks. Nobody died in the Eyjafjallajökull eruption, but in 1985 an eruption beneath an icy mountain in the Colombian Andes sent massive mudflows coursing downstream, killing more than 20,000 people. Dozens of volcanoes mantled with ice are scattered around the world, each posing a distinct hazard. The volcano responsible for that killer eruption of 1985 was of course Nevado del Ruiz; the 25th anniversary of that event will be on 13 November this year. At Nevado del Ruiz human failings in monitoring and communication (along with unfortunate weather conditions that obscured the summit) rather than geology were to blame for the scale of the disaster, but the eruption certainly illustrates the particularly hazardous nature of ice-capped volcanoes. Posted by admin in activity reports, Dukono, Ecuador, eruptions, Eyjafjöll, Gorely, Hawaii, Iceland, Indonesia, Japan, Kamchatka, Karymsky, Kilauea, Kirishima, Kliuchevskoi, Pacific, Papua New Guinea, Russia, Sakura-jima, Shiveluch, Tungurahua, Ulawun, United States, Weekly Volcanic Activity Reports. 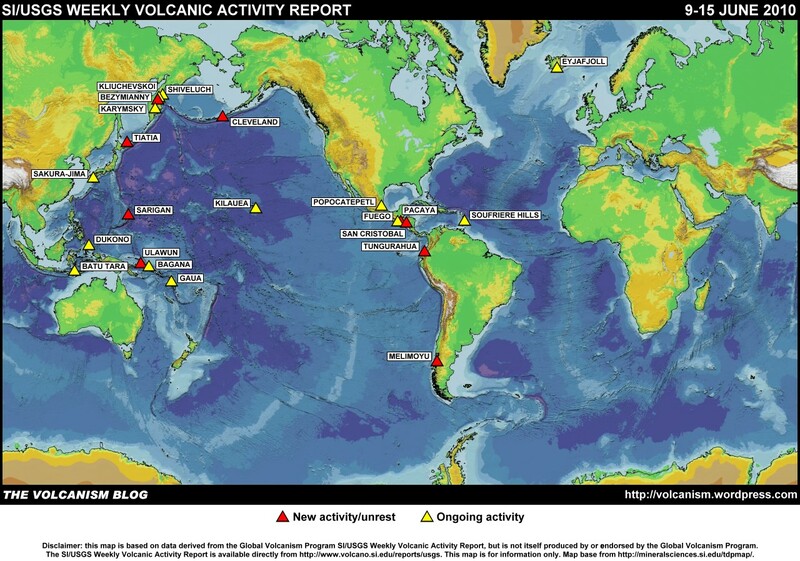 The Smithsonian Institution/United States Geological Survey Weekly Volcanic Activity Report for 23-29 June 2010 is now available on the Global Volcanism Program website. The following is a summary and not a substitute for the full report. 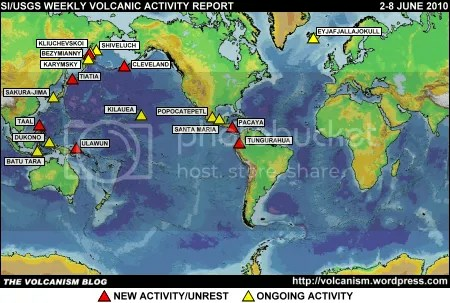 New activity/unrest: Gorely (Russia), Pagan (Mariana Islands), Tungurahua (Ecuador), Ulawun (Papua New Guinea). Ongoing activity: Dukono (Indonesia), Eyjafjallajökull (Iceland), Karymsky (Russia), Kilauea (Hawaii USA), Kirishima (Japan), Kliuchevskoi (Russia), Sakura-jima (Japan), Shiveluch (Russia). Posted by admin in Eyjafjöll, history of volcanology, Iceland, volcanoes. The remarkable fall of the barometer which took place almost simultaneously throughout all Europe, in the month of December, 1821, and which in some cases was accompanied with an agitation of the magnetic needle, brought many persons to conjecture that some tremendous convulsion of nature must have visited some part of the globe. This conjecture has at last been verified by a volcanic eruption of the old volcano of Eyafjeld Jokkul, which has been in a quiet state since the year 1612. This mountain, otherwise called Mount Hecla, is about 5666 feet in height. It is nearly equidistant from Kolla and Hecla, and is the southernmost of the chain where a dreadful eruption broke out about the middle of the last century. On the 19th December, 1821, the eruption began. The crater was formed at the distance of five miles from the minister’s house at Holt, and discharged itself through the thick mass of ice that enveloped it, and which is never melted. The ice was dispersed in every direction, of which one mass, 18 feet high, and 60 feet in circumference, fell towards the north. A number of stones, of different sizes, rolled down the mountain, accompanied with a noise like thunder; and this was immediately followed by a discharge of an enormous and lofty column of flame, which illuminated the whole country, and allowed the people in Holt to read as perfectly within their houses at night as if it had been day. Ashes, stones, gravel, and heavy masses of rock, some of which weighed about 50 lbs, were thrown up, and one of these last was found at the distance of five miles from the crater. On the day immediately following the eruption, a great quantity of fine greyish-white powder of pumice was discharged, and carried about by the wind so as to fall like snow, through every opening. It exhaled a disagreeable smell of sulphur, brought on affections in the eyes, and occasioned diseases among the sheep in Vaster Eyafjeld and Oster Landoe. On the 25th of December, a violent storm raged from the south, and by the united action of the wind and rain, the fields were cleaned of the sulphurous dust which had covered them. On the 26th and 27th of December, there was a heavy storm from the north-east, and the barometer, which had been gradually falling since the 18th December, when it was 29° 16, had reached, on the 26th December, its lowest point at 28° 49. It is a curious fact, however, that on the 8th of February, the barometer fell to 27° 25, a time when no earthquake was felt, and no apparent change had taken place in the eruption. On the 18th of February, the barometer, which had been at 29° 42 on the 11th fell to 27° 72. So late as the 23d of February, the Eyafjeld Jokkul emitted smoke greatly resembling the steam of boiling water; and some persons were of the opinion that the mountain had decreased, and was lower near the crater, as it evidently appeared to be when viewed in a direction from north to south. It is stated that the water in the rivers that flow from the Jokkul and the surrounding mountains, had been considerably enlarged during the first day’s eruption. A constant rumbling noise was heard in the vicinity of the volcano, attended occasionally by a dreadful crash, as if the immense masses of stones and ice were on the eve of all being precipitated down the mountain. Other two volcanoes to the east, in the mountains of Kolla and Oraefa Jokkul, are said to have broken out, but no certain information has been received on that subject. The vessel which brought the account of the volcanic eruption to Copenhagen, left Iceland on the 7th of March and it is reported that the sailors, when at sea, again saw a violent fire in the direction of the volcano.